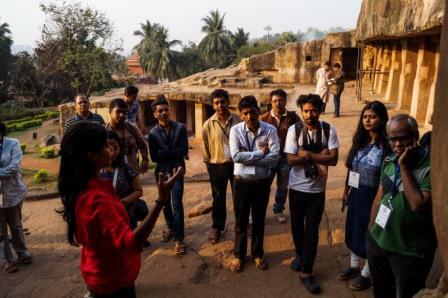 Bhubaneswar: The 13th heritage walk at Udayagiri and Khandagiri was on Saturday a great occasion to explore the stories of the Jain links as the twin hills have seen the roles played by the rulers, monks, Queens, sculptors dancers and the members of the royal court. While Maria Belgerave from West Indies joined today’s event as a walker with her Odia application developer hubby Amaresh Mohapatra, three students of second year B.Arch from Piloo Mody College of Architecture, Cuttack joined with Avik Raha, a banker from Mumbai and his wife Alpa Sarkar, an IT professional from Tech Mahindra. Alpa belongs to the Temple City and studied here and her father was a senior scientist with the Central Institute of Freshwater Aquaculture, Kausalyagang, on the city’s outskirts. The walkers today had a heartfelt discussion on the various topics related to the Twin Hills and especially how the images on the walls of Rani Gumpha (ground floor) depicting a dance form enjoyed by the entire court of the ruler, man-animal conflicts on the first floor of the same cave and how the sculptors/designers have devised the designs of the tiny compartments with double-decker facility and beautiful drainage system. Maria from Barbados (birth place of the legendary cricket icon Sir Garfield Sobers) in West Indies was delighted to know the rich cultural heritage anecdotes associated with the twin hills and her husband Amaresh also reminded their first trip to the Old Town Circuit a year ago. Amaresh, who was working with his US employer in the past was posted in West Indies for four years and there their love story started, which later bloomed like a real-life blockbuster. Amaresh belongs to Ganjam district in Odisha and currently workd for a city-based IT firm in the Infocity area. Avik, Alpa’s husband also admitted that knowing so much on the city’s history, its great rulers, genesis of classical dance forms from rock images and the stories of Jain and Buddhist links with the ancient hills would become a nice thing to remember.